A new determination for victory in the Tribal Messiah mission as members from a central providential nation. FFWPU Korea: Rev. 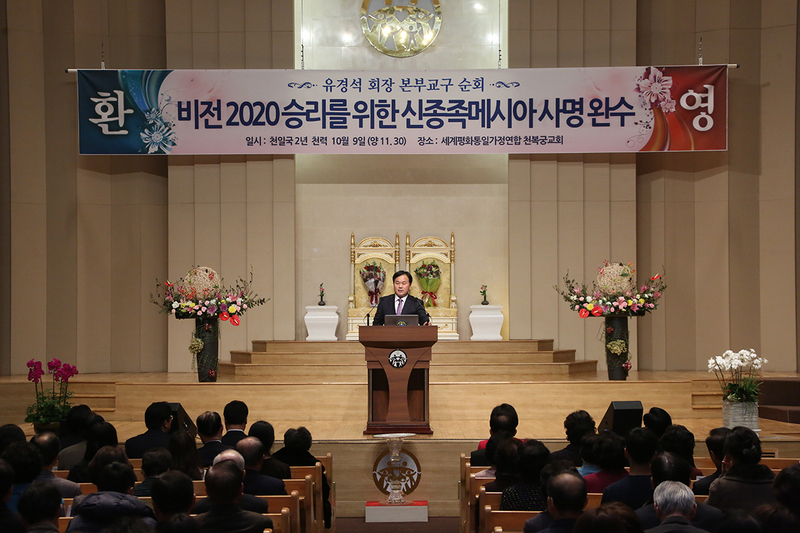 Ryu Kyeong Seuk, president of FFWPU Korea toured church regions in Korea, to deliver True Mother’s most recent message emphasizing the mission and responsibility of the key providential nations to pursue the new Tribal Messiah mission for Vision 2020 victory. Rev. Lu embarked on his nationwide tour, slated for the later months of 2014, with the aim of lighting a torch of inspiration so that all the members and blessed families can devote themselves for victory. The tour began on day 21 of the 9th month (November 13) when Rev. Lu and his wife, in the company of Shin Inseon, head of the witnessing department, Cho Seongil, head of the planning and promotion department and Jeon Jeongcheol, head of the audio-visual department and others visited the Busan and Gyeongnam church headquarters. After arriving at the Gimhae airport around 8 am, Rev. Ryu and the department heads went to the Busan church headquarters where they first made a bow of greeting and report prayer to True Parents. 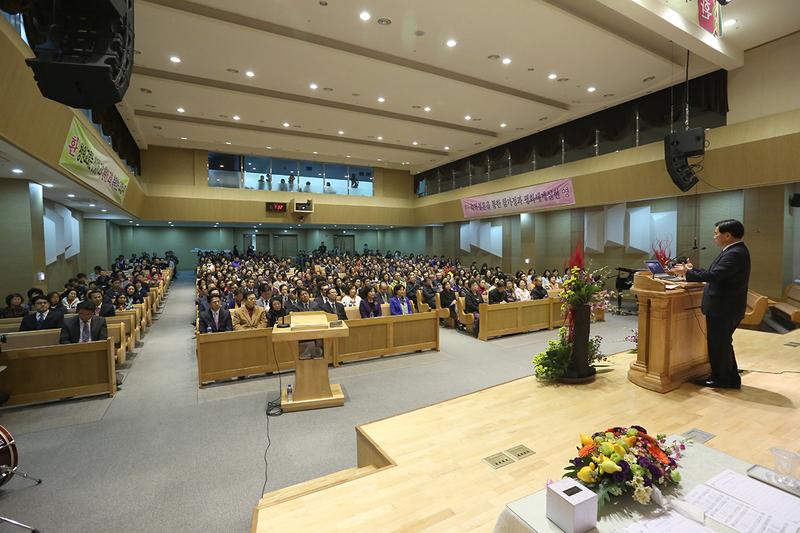 Then they began their first official event of the tour, speaking to the key members of the Busan church. 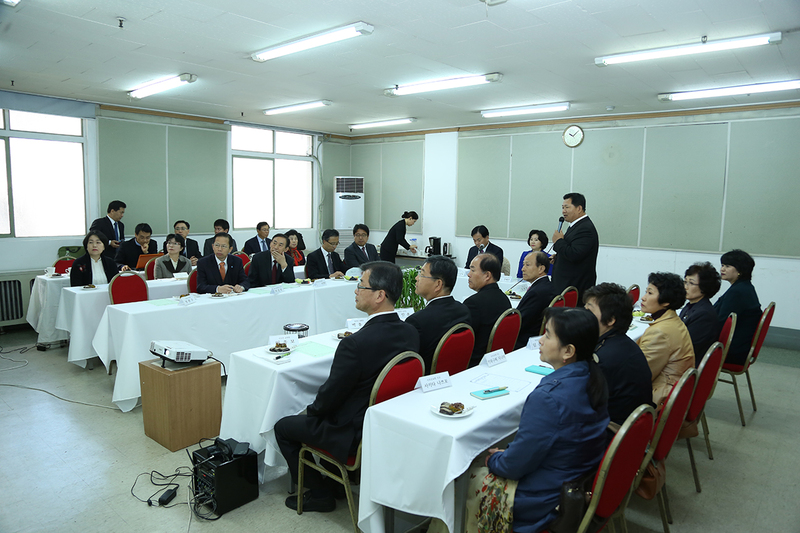 About twenty key members gathered for the first meeting in lecture room #1 on the sixth floor of the Busan headquarters, including the regional leader and his wife, senior pastors, Japanese missionary leaders and representatives of providential organizations in the area. After delivering his message, which emphasized that “Two things that we must keep in mind as people who are following the way of God’s will to build the world that True Parents are guiding us to create are ‘confidence’ and ‘conviction’. These two keys, along with attending our regional leader and True Parents, are what will confirm our identity as citizens of Cheon Il Guk.” Rev. Ryu entreated those present, as public figures, to be exemplary in demonstrating their identity as Cheon Il Guk citizens. After his report on the status of the Busan region, which explained the activities of providential organizations, along with the strategies and road map for witnessing, regional leader Kim Hyeongjeong reported that, “Internally, our plan is to focus on contacting inactive families and providing educational programs for members, while externally we will focus on witnessing activities through CARP, UPF and other providential organizations, in order to expand our contact with young people, college students and Ambassadors of Peace. Rev. 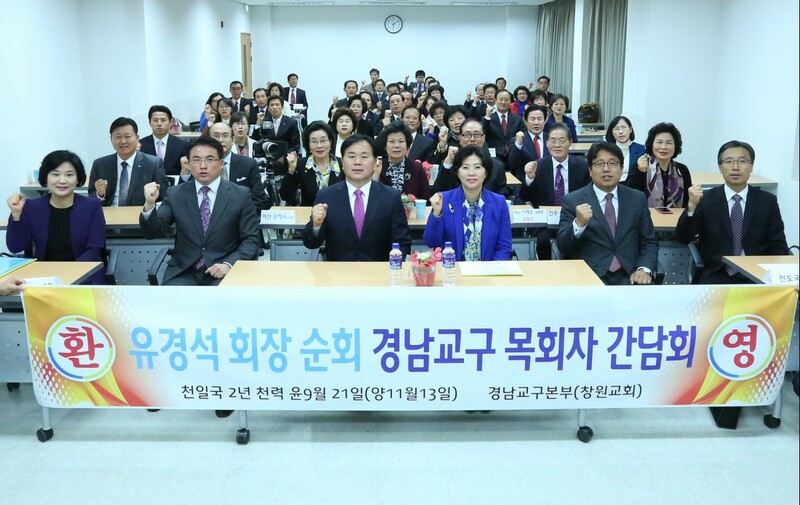 Ryu’s rally for the Busan region was held in the 7th floor of the Busan headquarters with 300 central members in attendance. The rally began with a video of True Mother speaking about the ‘Victory in the New Tribal Messiah Mission for Vision 2020’. Listening to True Mother explain that, just like the monarch butterflies which follow the laws of nature and travel thousands of kilometers up and down every unexplored corner of the Korean peninsula, “We must be a nation who moves without fear or hesitation to pursue victory in the new tribal messiah mission, for Vision 2020,” the members at the rally shed tears of repentance and determination, and offered gratitude through their applause. Rev. Ryu continued by reading from True Mother’s recent speeches, included her message from the World Joint Worship held at Cheongshim Peace World Center on October 26, proclaiming the depth of the heart and leadership of True Parents, who have come as the fruit of human history and as the owners of true love, true life and true lineage. Following the reading, he spoke of how we must realize the precious value of True Parents, what a great grace we have received in being able to live and breathe in this time when we can attend True Parents directly, and how precious the tribal messiah mission is, giving us the chance to bring a witnessing victory that we can be proud of in front of our descendents. In order to pursue this goal, he outlined a 100 day special mobilization for the end of the year. After the rally, Kim Eungnyeong, minister of South Busan church testified that through Rev. Ryu’s rally, he had gained a renewed understanding of the vision of a healthy Unification Church. Lim Jongbo, minister of West Busan church proclaimed that all of us must embrace our identity without the tiniest hesitation, and follow our providential mission and God’s Will, setting up twelve families of spiritual children, by taking on the tribal messiah mission. After the morning activities were finished, Rev. Ryu and his party quickly departed for the Gyeongnam headquarters, where they arrived at about 4 pm. At the Gyeongnam rally, Gyeongnam Regional Director Oh Jebaek testified, “We must work to harvest the results of witnessing in spirit and in truth, and he went on to explain plans for new tribal messiah activities through clan associations. Following that, plans for Gyeongnam’s 100 day mobilization, utilizing the HCC witnessing center, were outlined. 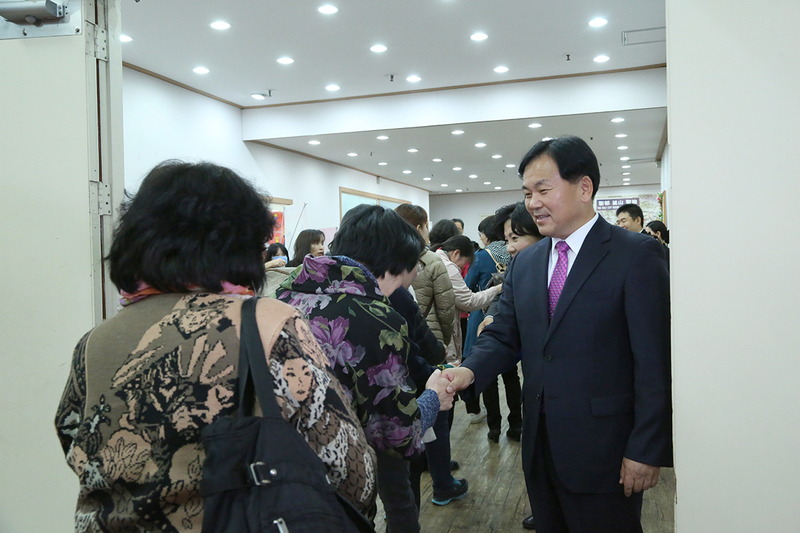 After the grace of the message of inspiration, which bound the members with one heart, the Gyeongnam rally concluded as Choi Sugyeong, minister of the Geoje church led all those gathered in three cheers of ogmansei in determination for victory through new tribal messiah activities for Vision 2020.